We’ve just gone through one of the driest five-month periods on record in Kitsap County, yet the total precipitation for entire water year was fairly close to average. In Hansville — at the north end of the peninsula — the total rainfall for the year reached 35.2 inches, about 3.5 inches above average. In Silverdale — about midway from north to south — the total rainfall was recorded as 43.1 inches, about 5 inches below average. In Holly — near the south end — the total rainfall came in at 82 inches, about 3.3 inches above average. The graphs of precipitation for the three areas show how this year’s rainfall tracked with the average rainfall through the entire year. The orange line depicts accumulated rainfall for water year 2018, while the pink line represents the average. Click on the images to enlarge and get a better view. Silverdale recorded 2.9 inches during that period, second only to 2003, which had 2.4 inches. 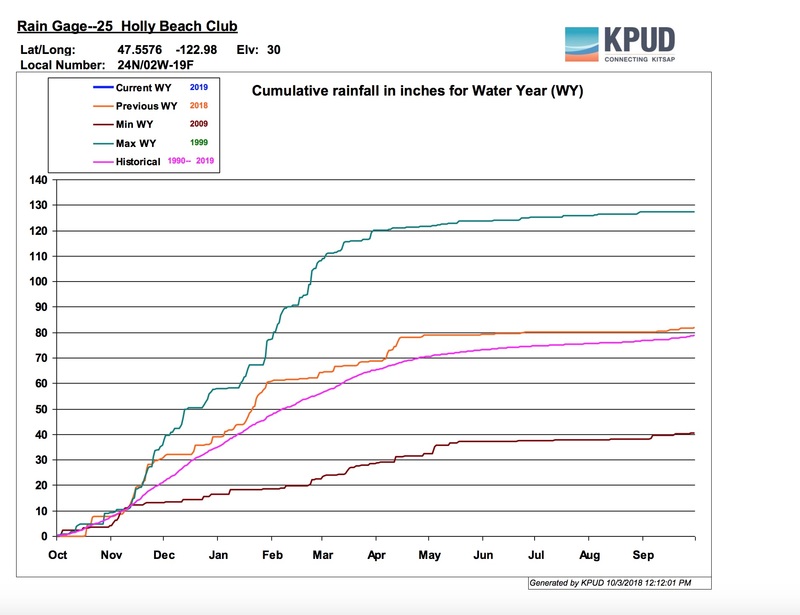 Holly received 2.9 inches during that period, second only to 2003, which had 1.4 inches. 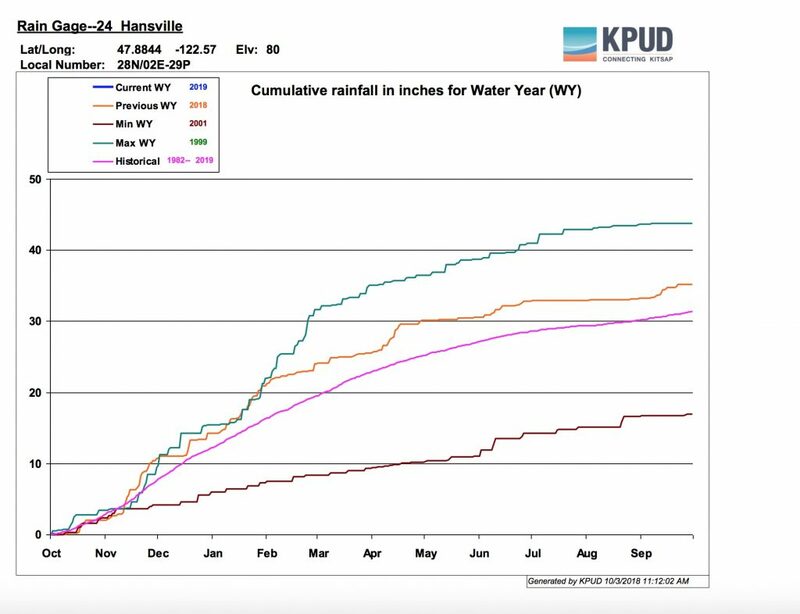 Normally dry Hansville was the big surprise, receiving more measurable rain events through the summer and ending with a total rainfall of 5 inches. 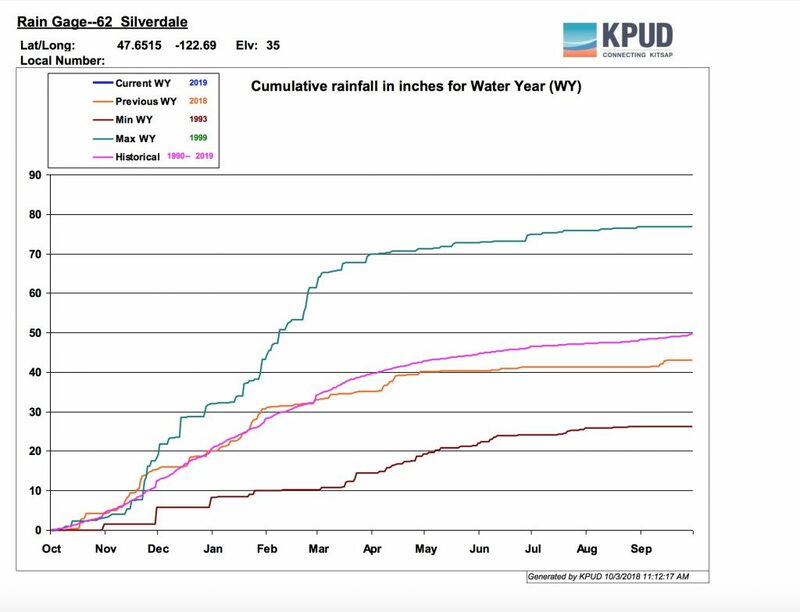 That’s twice the rainfall in Silverdale and nearly twice that of Holly during the five months ending Sept. 30. With less than 2 inches of rainfall in September for all three areas, the ground has been barely dampened so far this fall. Many streams remain very low, including salmon streams that need a lot more water if the salmon are to make it upstream and spawn successfully. Wildcat Creek, a tributary of Chico Creek, is “just a trickle,” according to Jon Oleyar, a biologist for the Suquamish Tribe who counts fish in the East Kitsap streams. “It’s a little early yet,” Jon told me in reference to the anticipated runs of chum and coho salmon. Jon says he doesn’t expect to see many coho in Kitsap streams this year, because most coho hatcheries have been phased out and predictions are for low runs of wild coho. While Jon is seeing almost no chum salmon in the streams at this time, early runs of chum may be entering Puget Sound and beginning to head for their natal streams. Greater numbers of chum are expected to follow. Orca Network, which keeps tabs on whale movements, mentioned in its latest sighting report that killer whales have made their first forays into Puget Sound in search of chum, which become their primary prey in the fall when the Chinook salmon runs dwindle. It will take significant rainfall over the next two to three weeks to get the chum moving up the streams, according to Jon Oleyar. Once the streams rise, steady, drizzly rains are considered the optimum weather for our salmon. I will try to alert readers of Water Ways when the salmon begin to make their way upstream. I always encourage people to take a look at our magnificent salmon and observe their spawning without disturbing the salmon in the stream. My salmon-viewing map is still available on the Kitsap Sun website, although it does not entirely reflect changes in the landscape since I retired from the Sun’s staff at the end of 2014. Kitsap Salmon Tours, organized by WSU Kitsap County Extension, is scheduled for Nov. 3 this year. The event helps people understand about salmon growth, spawning and behavior. Information about the event and various explanatory documents about salmon are available on the Kitsap Salmon tours website.